This is an In Person signed Black and White 10" x 8" photo of the British singer and songwriter. 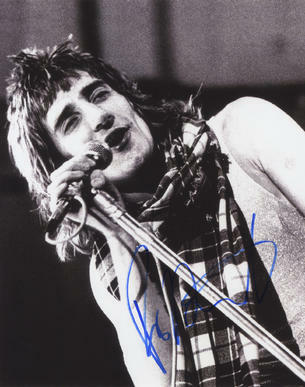 Roderick David "Rod" Stewart, CBE (born 10 January 1945) is a British singer-songwriter and musician, born and raised in North London, England and currently residing in Epping. He is of Scottish and English ancestry. With his distinctive raspy singing voice, Stewart came to prominence in the late 1960s and early 1970s with The Jeff Beck Group and then Faces. He launched his solo career in 1969 with his debut album An Old Raincoat Won't Ever Let You Down (US: The Rod Stewart Album). His work with The Jeff Beck Group and Faces proved to be influential on the formation of the punk rock and heavy metal genres. With his career in its fifth decade, Stewart has sold over 100 million records worldwide, making him one of the best selling artists of all time. In the UK, he has garnered six consecutive number one albums, and his tally of 62 hit singles include 31 that reached the top 10, six of which gained the number one position. He has had 16 top ten singles in the U.S, with four of these reaching number one on the Billboard Hot 100. In 2008, Billboard magazine ranked him the 17th most successful artist on the "The Billboard Hot 100 Top All-Time Artists". He was voted at #33 in Q Magazine's list of the top 100 Greatest Singers of all time, and #59 on Rolling Stone 100 Greatest Singers of all time. As a solo artist, Stewart was inducted into the Rock and Roll Hall of Fame in 1994, and will be inducted a second time, as a member of Faces, in April 2012.